Typically rose-pink to red in color (with streaks of black), Rhodonite is found in metamorphic rocks across the world. It’s the state gem of Massachusetts and the national stone of Russia, where it was first discovered in the late 1700s. Long ago peoples placed small Rhodonite stones in babies’ cribs, hoping the wee ones would grow as strong and free as eagles. The wife of Czar Alexander II was entombed in a 12-ton sarcophagus carved from Rhodonite. The stone became a popular gift for travelers as protection against danger. A small Rhodonite desk clock made by Faberge sold at auction in 2010 for $134,500, more than four times its estimated price! Ranging from 5.5 to 6.5 on the Mohs scales of hardness (1-10), Rhodonite is usually tumbled or fashioned into cabochons, beads, or small sculptures. A stone of compassion, Rhodonite clears away past emotional scars while promoting unselfish self-love and forgiveness. It’s said to build confidence, lessen confusion, and open the way for you to achieve your highest potential. Metaphysical healers claim Rhodonite is beneficial for relationships, changing conflict into understanding. They say meditating with Rhodonite can bring your spirit back to its natural state of bliss, easing feelings of fear, panic, and stress. It’s the modern birthstone for those born under the sign of Taurus (April 21 – May 20). http://www.mcdougallminerals.com sold this stunning cluster of Rhodonite crystals from Peru for $500 CAD. Feng Shui practitioners recommend placing pink Rhodonite in the southwest area of a room or home to tap into the feminine energy of growth and maternal love. 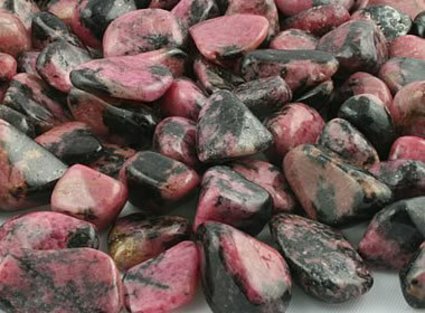 Rhodonite is said to stimulate the Heart Chakra, helping us in our relationships and our relationship with the external world. Clean Rhodonite with soapy water and a soft cloth. Don’t expose it to sudden changes in temperature, don’t wear it during physical activity, and please store it apart from other materials which might scratch its surface. 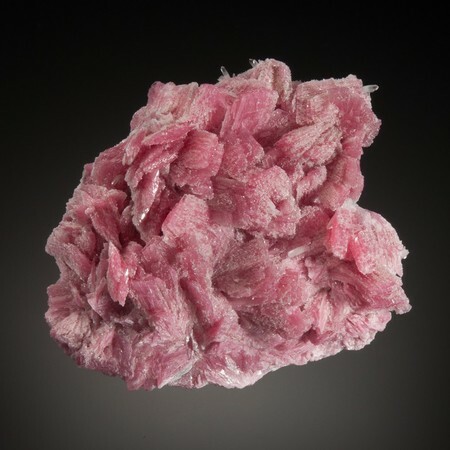 This entry was posted in Sunday's Gem and tagged healing gemstones, properties of Rhodonite, Rhodonite. Bookmark the permalink. I don’t remember seeing this stone, and I think I’d remember it, since the color is so striking. It’s just beautiful. The thought of that sarcophagus is pretty amazing, but even a bracelet made from the stone would be lovely. I laughed at the raw crystal. It looks like that pink fiberglass insulation. Linda, I’m glad you got a chuckle from the raw crystal version. I thought it looked like a cotton candy snowcone! Rhodonite isn’t a very common stone, so I’m not surprised you haven’t seen any. It’s really too delicate to cut it in facets, but beads and such are quite pretty. HaHa! Check here for a photo (http://www.saint-petersburg.com/cemeteries/tombs-of-the-peter-and-paul-fortress/). You’re right, it’s something else! Hate to think how much something like that could cost!!! These stones have a friendly look (I know weird). Thanks, Debbie. I think ‘friendly’ is a good word for them. And, if memory serves me right, you’re a Taurus, John, so you probably should have some Rhodonite!! Nope I’m a Gemini. I would say cusp of Taurus. Oops, I was looking at the wrong month — sorry! I’ll have to find another gemstone for you then. WOW…now that is so interesting, Debbie! I did not know that. I also found it extremely interesting to read about the wife of Czar Alexander III because I have such a fascination with Russian history and their Czar’s! That final photo of the Rhodonite crystals from Peru is stunning! I love gemstones in their raw form, like that. Once again, thanks so much for sharing another informative gemstone post, my friend. You always teach me things I didn’t know. Aw, what nice things to say, Ron — thank you! I’m always delighted when I can dig out some interesting tidbits for these gemstone posts. Thanks, Miss A. I was pretty hesitant about the crib idea, too. Seems there are already enough dangers in a tiny baby’s life without adding to the mix!